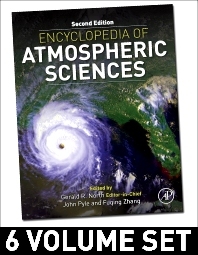 Encyclopedia of Atmospheric Sciences, 2nd Edition is an authoritative resource covering all aspects of atmospheric sciences, including both theory and applications. With more than 320 articles and 1,600 figures and photographs, this revised version of the award-winning first edition offers comprehensive coverage of this important field. The six volumes in this set contain broad-ranging articles on topics such as atmospheric chemistry, biogeochemical cycles, boundary layers, clouds, general circulation, global change, mesoscale meteorology, ozone, radar, satellite remote sensing, and weather prediction. The Encyclopedia is an ideal resource for academia, government, and industry in the fields of atmospheric, ocean, and environmental sciences. It is written at a level that allows undergraduate students to understand the material, while providing active researchers with the latest information in the field. Named as a 2002 BEST REFERENCE SOURCE by Library Journal!